T17 Patricia Keith.jpg - The Way of Rockport Indiana, Inc. The Way of Rockport Indiana, Inc.
Can you believe that "Tour of Tables" is just around the corner? 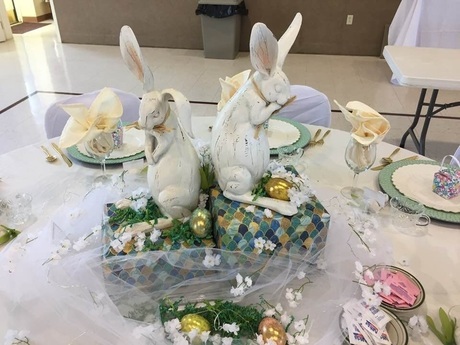 The 11th - Annual Tour of Tables will be held on April 25th at Gideon Hall, Trinity United Methodist Church. Doors open at 5:30. Dinner starts at 6:30. Tickets are $25. Judge Jon A. Dartt will be the speaker for the evening. Invite your friends and come dine (we have a new menu this year) with us and stroll around to see the decorated tables. Then meander around the items up for Silent Auction - you don't want to miss that special item you cannot leave without. Classes are held at the Church of the Nazarene's Basement on Monday and Friday nights from 6:30 until 7:30. If you have any questions about attending one of these classes, please call the office or Brett. Brett Cieslack is the Executive Director of all programs and Facilities for The Way of Rockport Indiana, Inc. An ex-offender himself, Brett was given the vision to begin this ministry in 2005. After training in Crossville Tennessee's "Bread of Life Mission," Brett returned to Rockport to work through the Spencer County Probation office and with the jail staff in beginning to reach other offenders. Shortly thereafter, Brett began Celebrate Recovery classes. For Brett's complete testimony of how the Lord reached him, please inquire. It is a wonderful story of deliverance to calling! If you have an emergency or would like someone to speak with about your situation, please stop by our office at 317 Main Street to see Brett or call the office at 812.649-2480, you can call Brett on his cell (812) 393-9715.